Based in Atlanta, Georgia, Jiha Moon (Korean, born 1973) harvests cultural elements native to Korea, Japan, and China and then unites them with Western elements to investigate the multi-faceted nature of our current global identity as influenced by popular culture, technology, racial perceptions and folklore. 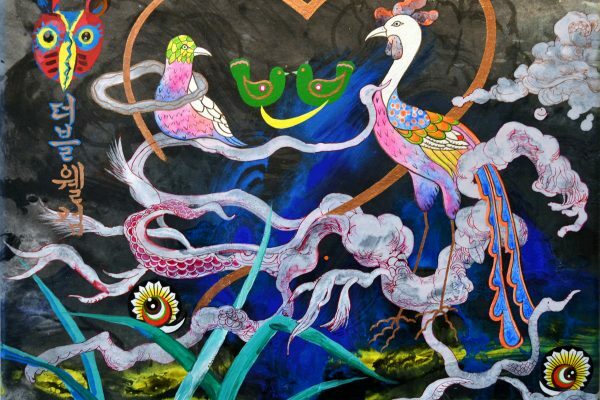 Featuring over 50 works, Moon blurs the lines between Western and Eastern identified iconography such as the characters from the online game Angry Birds© and smart phone Emojis which float alongside Asian tigers and Indian gods, in compositions that appear both familiar and foreign simultaneously. Moon’s witty and ironic work explores how Westerners perceive other cultures and how perceived foreigners see the West. Korean born, now living in the United States, Moon asks the pertinent question, “Why do people love foreign stuff so much? When we travel to other countries, explore different cultures and meet with new people, we tend to fall in love with things that are not our own. People have a soft spot for foreign things. The world is so interconnected nowadays, how can you even tell where someone or something ‘comes from’ anymore?” In her work, Moon acts in the role of a traveler and explores the notion that identity is not beholden to geographic location. 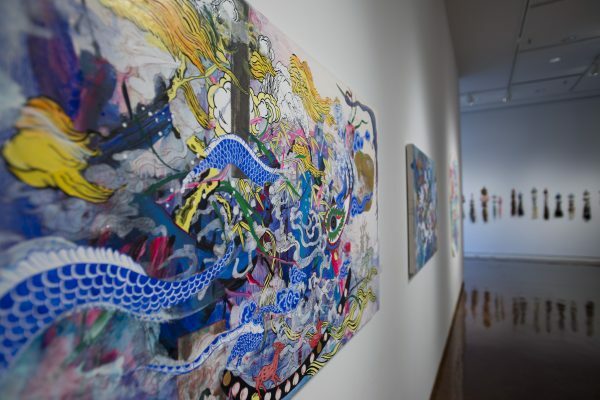 Honoring traditional Asian arts through her use of Hanji paper, Korean silk, and calligraphic brushstrokes, throughout the exhibition she plays with iconography and symbols that have been classified as “foreign” such as blue willow china patterns, fortune cookies (which originated in California but are identified as Chinese), Korean fans and floating dragons and intermingles them with references to Pop and southern folk art. Her use of the peach identified in Chinese mythology as a symbol of immortality is also a nod to her home state of Georgia’s state fruit, the Georgia Peach. Moon transforms a traditional Korean fashion accessory called Norigae into endearing quirky manifestations of various personalities, with such names as Gloria and Rachel whose hair is interwoven with eclectic items such as children’s plastic barrettes or Native American beaded dolls. Her misshapen and whimsical ceramics reference southern folk art face jugs yet are painted in traditional Asian ceramic glazes and motifs. 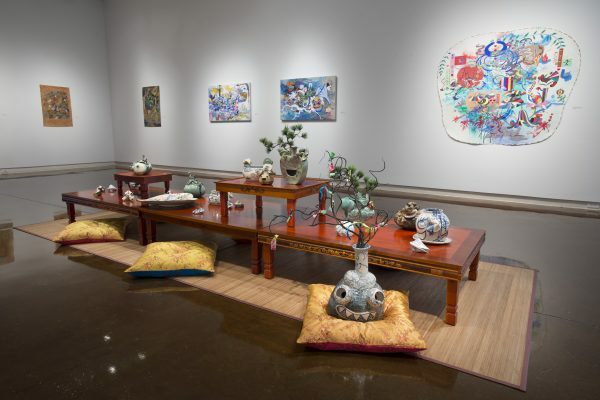 At the heart of the exhibition, Moon presents an installation featuring perceived kitschy elements of Asian home décor: low wooden tables and silk embroidered pillows placed on Japanese tatami mats. Displayed on the various surfaces are her unconventional ceramic works reflecting her interest in the “beautiful awkward” in which she makes reference to a tourist’s desire to collect foreign and exotic elements to beautify their houses back home. 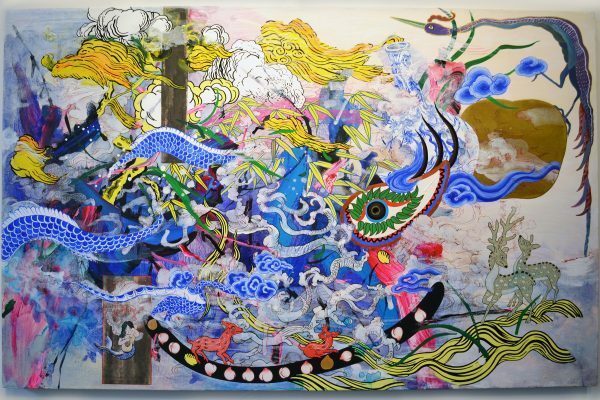 At first glance, Jiha Moon’s work appears as a mash up of high and low brow cultural references. Upon further inspection, slyly ironic and humorous references emerge that are satirically filtered by the artist, who reminds us that our preconceived notion of “others” is not a true manifestation of actual identity. Jiha Moon: Double Welcome, Most Everyone’s Mad Here is organized by the Taubman Museum of Art, Roanoke, Virginia in collaboration with the Halsey Institute of Contemporary Art, College of Charleston School of the Arts in Charleston, South Carolina. The exhibition is curated by Amy G. Moorefield, Deputy Director of Exhibitions and Collections at the Taubman Museum of Art and Mark Sloan, Director and Chief Curator of the Halsey Institute of Contemporary Art.